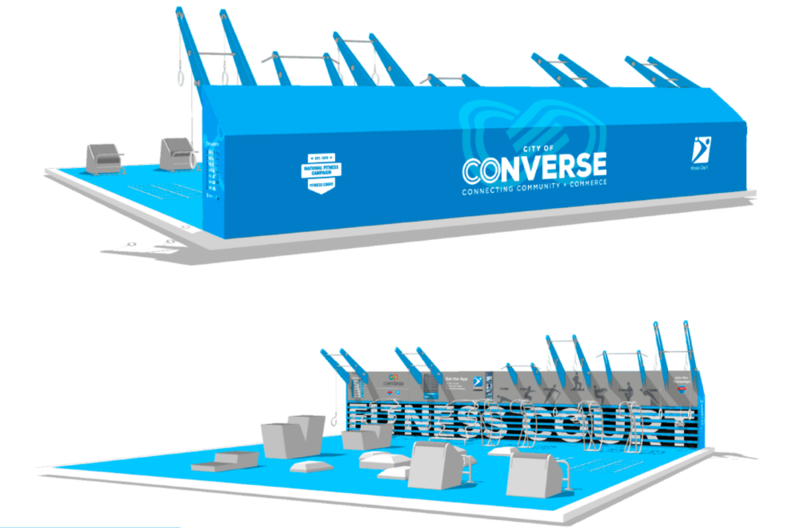 The Converse Fitness Court is NOW OPEN! The City of Converse is paving the way to a healthier community this month with a brand new Fitness Court in City Park! 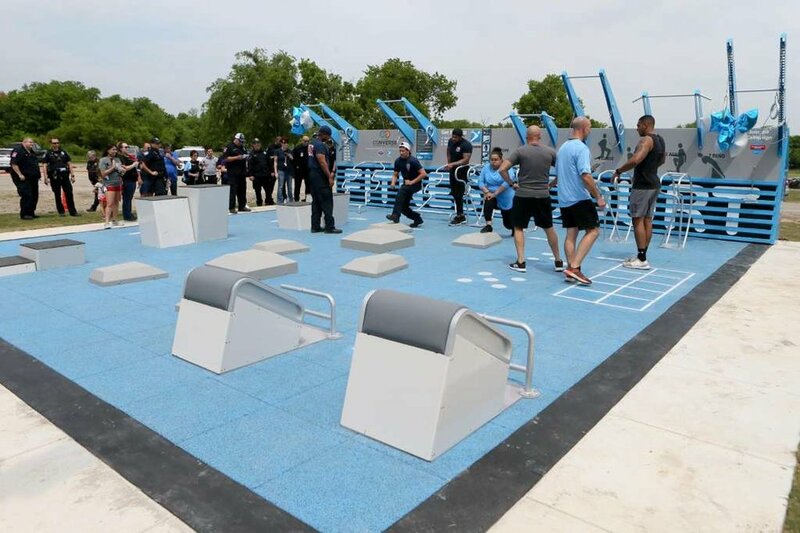 Through an exciting partnership with National Fitness Campaign, the city will officially activate their state-of-the-art outdoor gym facility in just a few weeks. 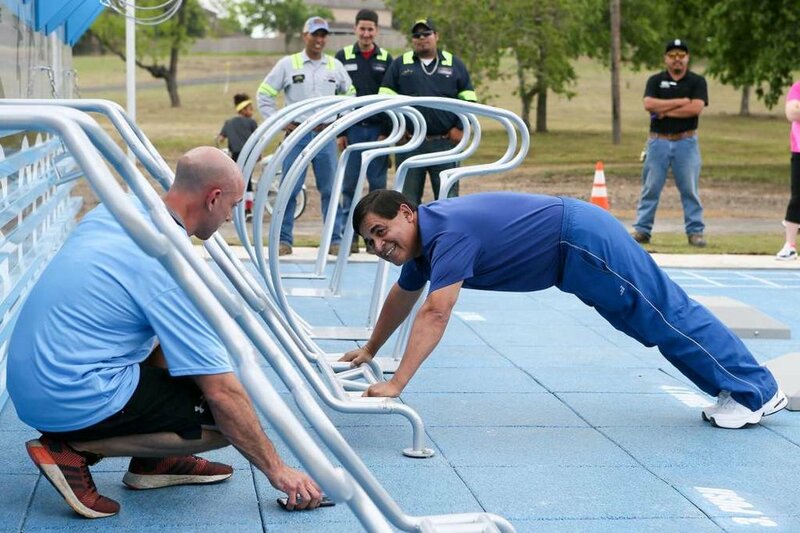 “We are very pleased that the new fitness court will be a high quality exercise experience for residents of all ages — to include our local military members — that will be free of charge for everyone,” said Al Suarez, city Mayor. 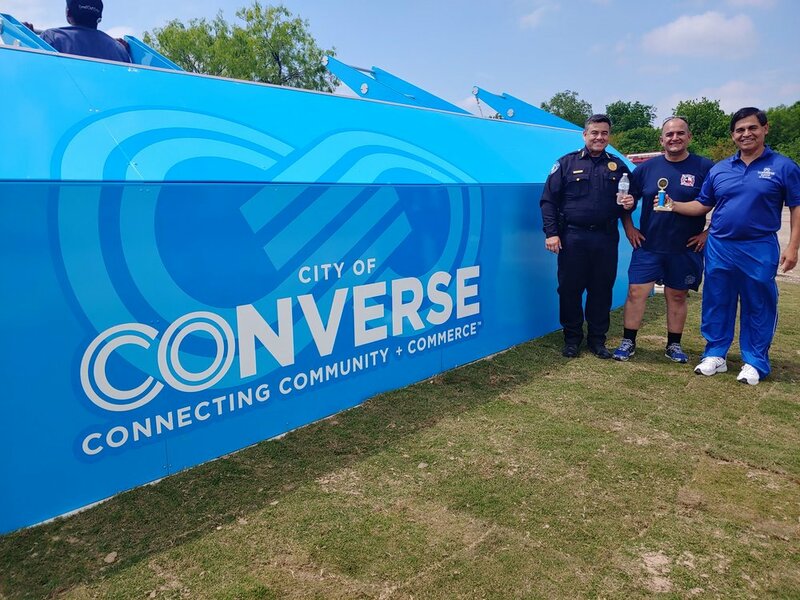 “We are encouraging and promoting healthy living for all our residents and this new addition will provide another viable option to living a good healthy life in the city of Converse." In City Park, the Fitness Court will be a great addition to an already active space, attracting residents and visitors that want a destination to have some fun outdoors with their family and friends. 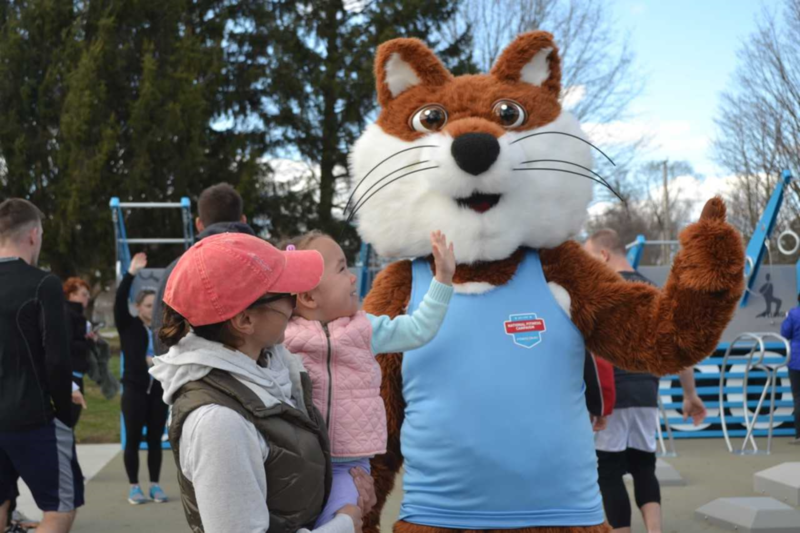 This April, residents of Converse welcomed the Fitness Court with an official ribbon cutting, free outdoor express classes, and a competitive fun-filled official Court Challenge. Users can take advantage of the Court’s free Fitness Court App, acting as a how-to guide and “coach in the pocket”. This self-guided mobile support makes it easy to master the Court’s seven movements at a customized pace and difficulty. THANK YOU CONVERSE FOR PUTTING FREE FITNESS ON THE MAP! The La Porte Fitness Court is NOW OPEN! La Porte, Indiana is paving the way to a healthier community this Spring with a brand new Fitness Court in Kesling Park! Through partnership with National Fitness Campaign and thanks to a generous donation from the Healthcare Foundation of La Porte, the city will officially activate their state-of-the-art outdoor gym facility in just a few weeks. Kesling Park is a unique destination, filled with amenities for the whole family — alongside racquetball courts, fitness trails, soccer fields and tennis courts, the Fitness Court will be an outstanding addition for anyone wanting to have some fun outdoors with their family and friends. Now that the Fitness Court is open, residents can take advantage of a no-cost “coach in the pocket” with the free Fitness Court App. This self-guided mobile support makes it easy for any user to master the Court’s seven movements at their own pace and level of ability. THANK YOU LA PORTE FOR PUTTING FREE FITNESS ON THE MAP! Foster City will unveil its brand new Fitness Court to the community on Saturday, April 27th, joining San Francisco and Sacramento as partners in the National Fitness Campaign. Located in Shorebird Park, this outdoor gym will be surrounded by 3.5 acres of bay-front green space. The park also features convenient parking, picnic facilities and direct access to the area’s most popular jogging and biking route – The Bay Trail. San Francisco’s Marina Green Fitness Court was the first to be installed along the iconic 365 mile trail – thanks to Foster City, users can now enjoy strength, calisthenics and circuit training at not one, but TWO trail locations! As always, this one-of-a-kind gym is completely free to the public, and available to during standard park hours. The city’s Parks and Recreation Department is committed to providing innovative services that contribute to a healthy community, and participating in this national campaign aligns with the City’s goal of promoting social equity for residents. The Foster City community is invited to try out the new facility and free mobile app during the fun Launch Party event scheduled for Saturday April 27th between 10:00 AM to 12:00 PM. The event will feature a quick fitness challenge and healthy snacks from local vendors, as well as express group classes and demonstrations. Grab your workout buddy and meet us on the #FitnessCourt! NFC is thrilled to welcome Oklahoma City, OK as the latest participant in the 2018 National Fitness Campaign. In this multi-site model city, community leaders and local trainers have decided to make world-class fitness free, and announced the launch of five outdoor Fitness Courts, the first of which will open at the Boathouse District. 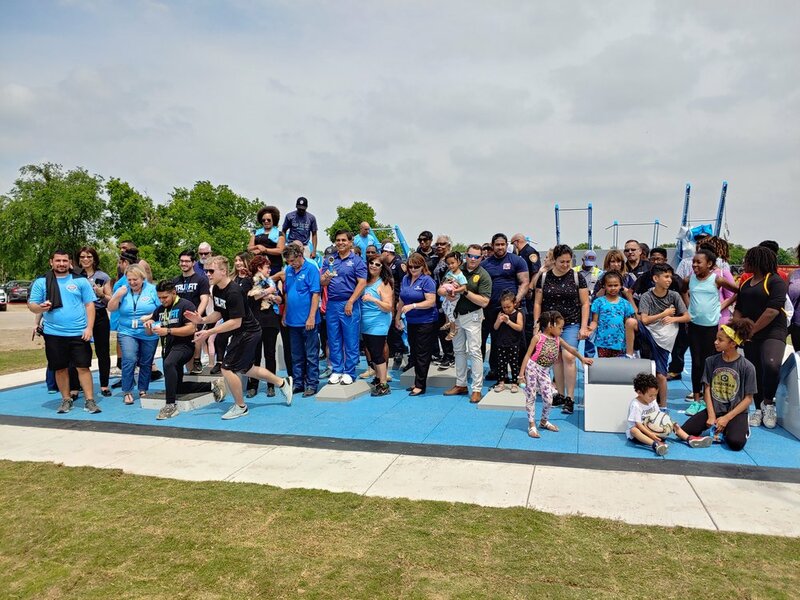 Director of Parks and Recreation, Doug Kupper, joins a network of partners, funding sponsors, and fitness fanatics nationwide to celebrate the effort to promote healthy living for residents. This beautiful city, home of the OKC Thunder and over 90 miles of trails, has spearheaded an initiative to bring affordable exercise amenities to those looking for a best-in-class full-body workout. An exciting Fitness Court Festival planned for next Saturday, April 6th will offer a free 45-minute bootcamp and giveaways from local vendors and media! This celebration will jump start the local fitness season, provide residents a chance to enjoy their new outdoor gym, and demonstrate how to stay fit with seven simple movements. The Boathouse District — where residents and visitors focus on fun, fitness and encouraging people to take on new challenges — is the perfect location to check out the City’s new upgrades to healthy community infrastructure. 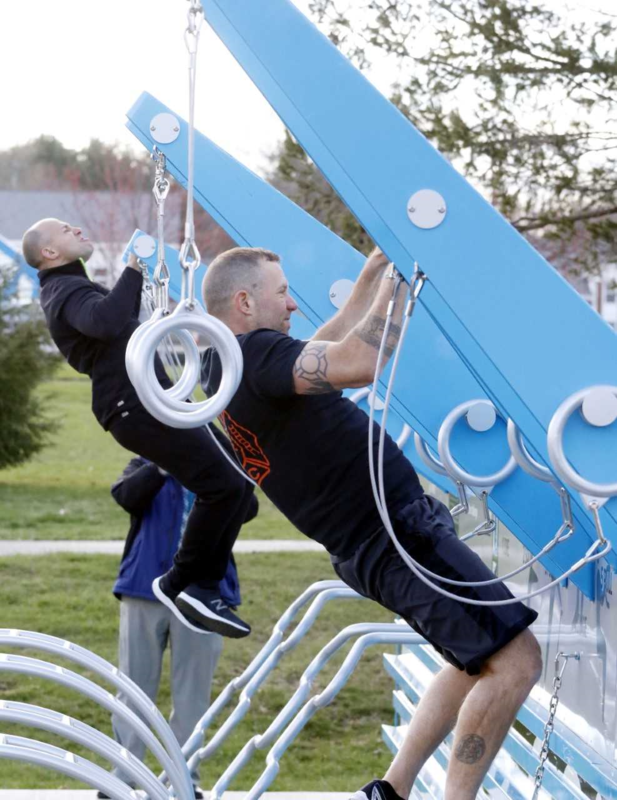 In addition, residents can find the world’s best outdoor gym in four more locations across the City — in Woodson Park, Stars & Stripes Park, Wiley Post Park and Douglass Park. 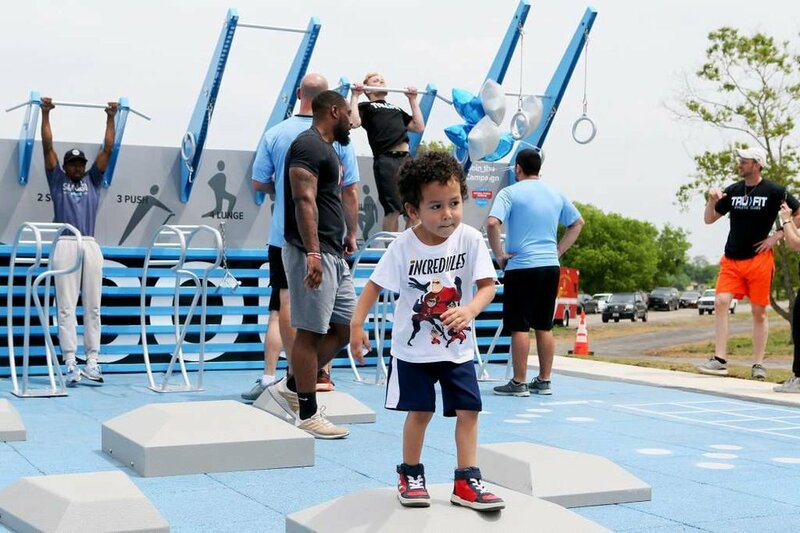 National Fitness Campaign and our partners in Oklahoma City, the Boathouse District and the OKC metro area invite residents to take advantage of the five new Fitness Court locations on Saturday, April 6th. For access to guided workouts and to get involved with exclusive training events, residents are invited to download the free Fitness Court App on iOS or Android. We’ll see you on the Fitness Court! The Holly Hill Fitness Court is NOW OPEN! The historic riverside City of Holly Hill, located along the eastern coast of Florida, is helping their residents get a head start on their new year goals! National Fitness Campaign is excited to launch a brand new Fitness Court for active adults in Holly Hill and surrounding areas. Local fitness ambassadors are getting trained and ready to begin activating free fitness for all. The outdoor bodyweight circuit training gym is soon to open for public use in Sunrise Park, suitable for adults of all abilities, and at no cost to residents. By using The Fitness Court with a free mobile app, members of the Holly Hill community and region can take classes, learn routines and get fit — all in their own local park! The city is dedicated to keeping residents excited about health and wellness, so their new Fitness Court is a public resource added to city infrastructure for the benefit of all residents. Friends, families and fit fans in Holly Hill have already started to enjoy their new outdoor workout — check it out yourself during your next walk along the water! THANK YOU HOLLY HILL FOR PUTTING FREE FITNESS ON THE MAP!